A best-seller in the caravan market, Duvalay’s latest sleep innovation is now available for the home. Immediately transform any tired, worn-out mattress into a cooler, comfier place to sleep with the revolutionary FreshTec topper. If you regularly feel too hot to sleep or suffer from night sweats, you’ll know the misery of tossing and turning all night long; it makes you feel tired and irritable for the day ahead. A simple solution is to layer a FreshTec topper over your existing mattress at home so you can enjoy the comfort and cooling benefits of our innovative new foam. Instead of retaining body heat, FreshTec allows air to circulate freely inside the cell structure – bringing your temperature down to a cooler, fresher level that encourages uninterrupted sleep; plus, you get all the benefits of traditional memory foam, which include effective pressure relief to ease tired, aching joints! Ideal for people with a bad back, as well as a tendency to sweat during the night, this clever product from Britain’s ‘Bed Manufacturer of the Year’ has a soft-touch feel that’s similar to latex and makes the world of difference to any poor-quality mattress. Smoothing out surface lumps and bumps, it also offers unbeatable full-body support. 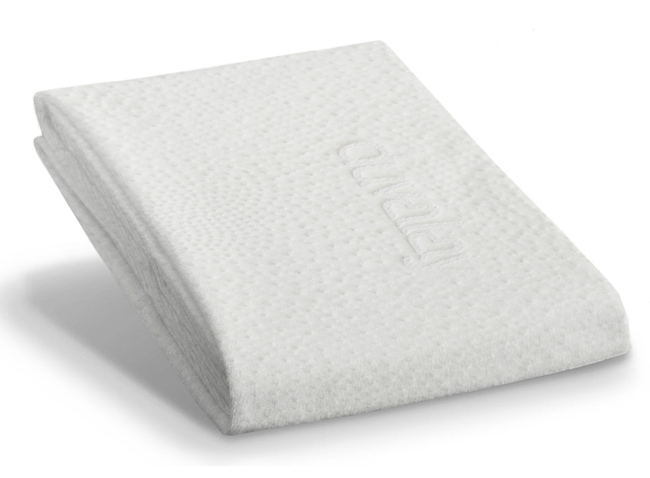 The luxurious cover not only feels soft to the touch, but also actively works with the foam to enhance its cooling properties. Simply unzip, pop it in the machine and wash it at 40C to follow the easy-care instructions. Single 190cm x 91cm x 5cm 6'3" x 3' x 2"
Small Double 190cm x 122cm x 5cm 6'3" x 4' x 2"
Double 190cm x 137cm x 5cm 6'3" x 4'6" x 2"
King 198cm x 152cm x 5cm 6'3" x 5' x 2"
Super King 198cm x 183cm x 5cm 6'3" x 6' x 2"